Emma snuck a Napkin Note into my gear before I left for work this morning. I don’t even know if I can begin to describe joy I feel. This is utterly awesome! 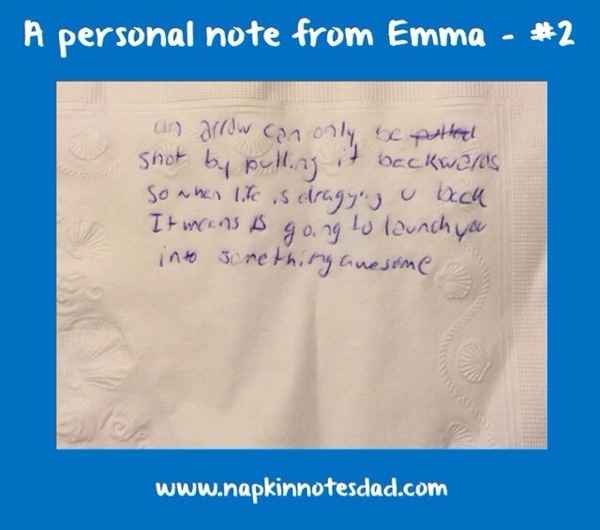 My daughter, to whom I have been writing Napkin Notes to for years, is now communicating to me in the same way. Today’s note reads: An arrow can only be shot by pulling it backwards. So when life is dragging u (you) back, it means it’s going to launch you into something awesome! Life has been dragging me back, even though I have resisted with all of my might. Many of you know my ongoing battle with cancer. It has taken a toll on all of my family. Today I had some great news on that front which I will be sharing once we have confirmation. Today I was the arrow. Hmm, Napkin Notes, I think that I may just be on to something here!